Publishing House T. 1-7, 16, 23-24 is not specified; T. 25-27: Acad. the sciences of the USSR; T. 28: Acad. Sciences of the USSR. Leningr. separation; T. 29-31, 33-36: Science; T. 40, 42: Dmitry Bulanin; T. 41: Archangel. center. Part of the volumes are printed: in the type. Edward Pratz; T. 10: in the Type. Ministry of Internal Affairs; T. 11-12: Type. 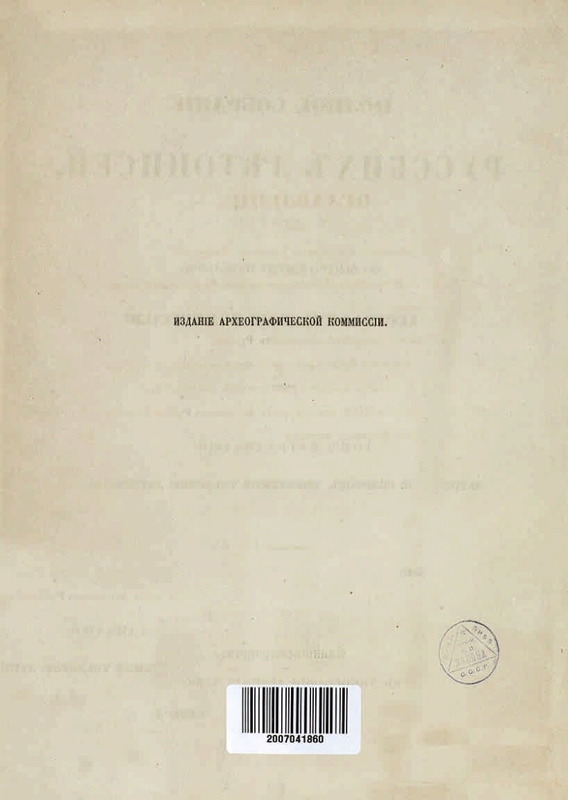 I. N. Skorokhodova; T. 17, 20: Type. M. A. Aleksandrova; Decree: Type. The main exercise. destinies. Nadzag. t. 25-27, 29-31, 33: Acad. Sciences of the USSR. Institute of History; t. 28 Acad. Sciences of the USSR. Lenigr. the Department of History; Acad. Sciences of the USSR. Institute of History of the USSR, Lenin. separation; t. 36 Acad. Sciences of the USSR. Institute of History of the USSR, Sib. Deposition of Acad. 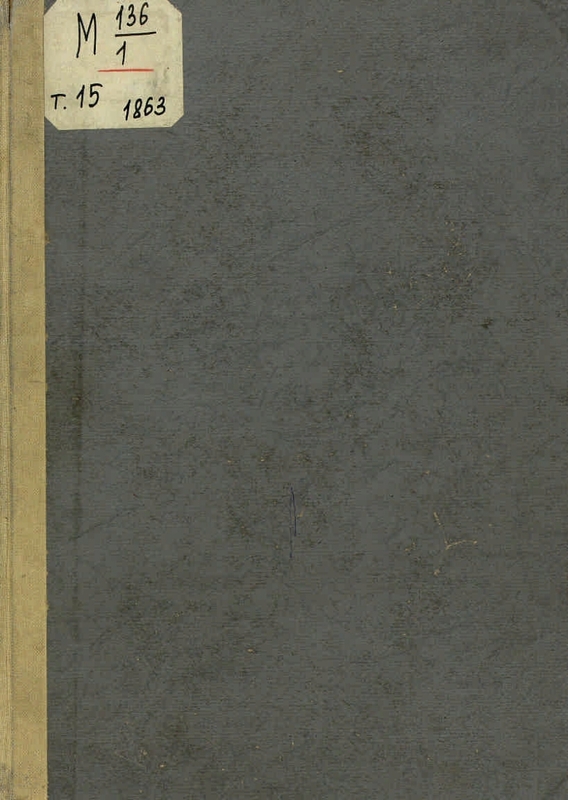 Sciences of the USSR, Institute of History, Philology and Philosophy; t. 39 Ros. acad. sciences. In-t grow. stories ; t. 40 Ros. acad. sciences. Institute of Rus. lit. (Pushkin House), vol. 42: Ros. acad. Sciences, S.-Petersburg. Institute of History, Institute of Rus. lit. (Pushkin House) . I. Bychkov, Afanasy Fedorovich (1818-1899). II. Adrianov, Sergey Alexandrovich (1871-1942). III. Barsukov, Nikolai Platonovich (1838-1906). IV. Nasonov, Arseniy Nikolaevich (1898-1965). V. Kazakova, Natalia Alexandrovna. VI. Okladnikov, Alexei Pavlovich (1908-1981). VII. Rybakov, Boris Alexandrovich (1908-2001). VIII. Priselkov, Mikhail Dmitrievich (1881-1941). IX. Kuzmina, L. F. .. X. Buganov, Viktor Ivanovich, (1928-1996). XI. Kisterev, S.N. XII. The Imperial Archaeographic Commission (St. Petersburg). XIII. Institute of History (Moscow). XIV. Institute of History. Leningrad branch (Moscow). XV. Institute of Soviet History (Moscow). XVI. Institute of History, Philology and Philosophy (Novosibirsk). XVII. Institute of Russian History (Moscow). XVIII. Institute of Russian Literature (St. Petersburg). XIX. St. Petersburg Institute of History. 1. Chronicles of the Russian. 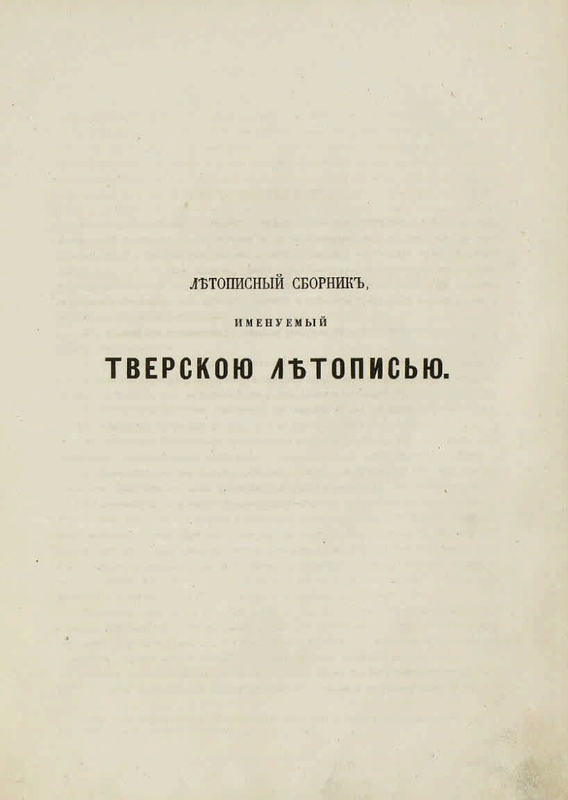 T. 15: Chronicle collection, called the Tver chronicle. - In the printing house of Leonid Demis, 1863. - VII p., 504 stb. : Fax. .
1. Territory (collection). 2. 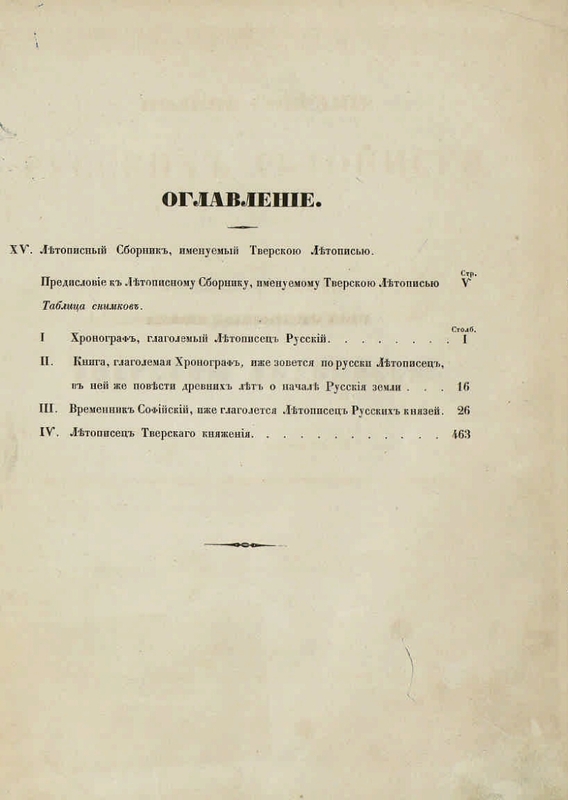 Tver region: pages of history (collection). 3. Chronicles of the n. 4. 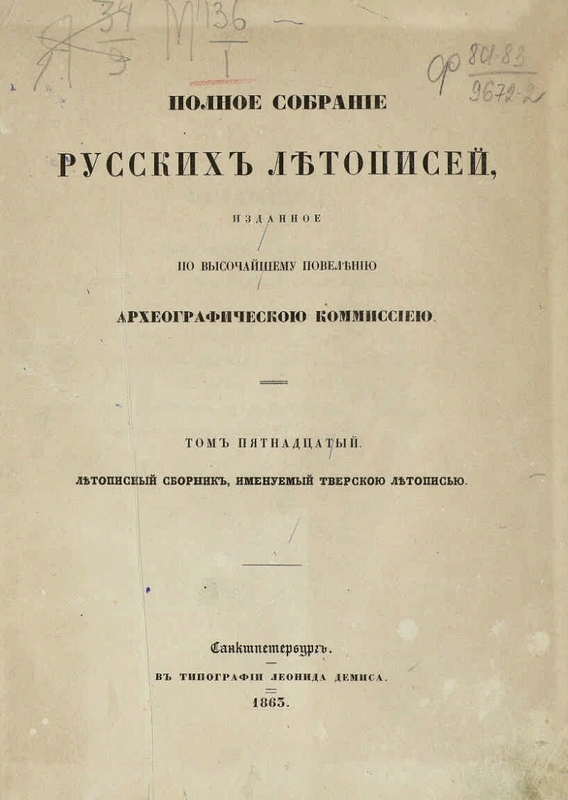 The Tver Chronicle. 5. The Tver Region - History.